The U.S. Department of Energy recommends between R-49 and R-60 of attic insulation in Simsbury, South Windsor, Longmeadow, and other areas. That's at least a 16-in.-thick blanket of fiberglass insulation! 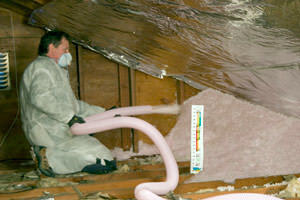 Contact us today to schedule your home energy evaluation to identify where your home is in need of more insulation. Our evaluation also diagnoses the other energy issues in your home-- which may be the larger factors in your home's high utility bills and discomfort. 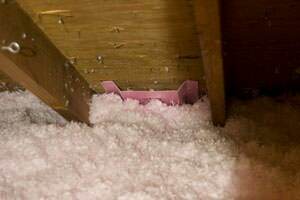 We offer Free Estimates for Attic Systems attic insulation in Longmeadow, Simsbury, South Windsor, Suffield, Granby, Wilbraham, Windsor, Chicopee, Springfield, Tolland, and the neighboring locations. We also offer a unique system called the SuperAttic™ System, which adds a continuous & airtight layer of foam insulation beneath the attic rafters and inside the attic's gable walls. This homeowner in Simsbury, CT had called us out because he had ice dams on his home in the winter. AS we know, Ice dams can damage your home pretty severely. So to stop this we took a look around the house and saw a knee wall with only fiberglass insulation in it. This insulation is clearly not doing its job because if it was, there would be no ice damming. To stop this from happening again, we start by removing all the old fiberglass insulation. Then we use our SilverGlo foam board insulation to block the floor bays. This stops cold air from getting into the floors and making that part of the house have inconsistent temperatures. When that is done, WE start to put up the runs of SilverGlo insulation. Its very important to air seal between everything to make an air tight seal so the heat you pay for in the winter does not head up the roof deck and cause ice damming. After that we dense pack down the slopes from the attic to insulate behind the SilverGlo we just put up. Now that we have properly insulated this knee wall space, this home owner will not have to get out the roof rakes to break up the ice damns ever again! Call 1-855-229-7070 or contact us online to schedule a home energy evaluation or a Free Estimate for home insulation in South Windsor, Longmeadow, Simsbury, Hartford, Springfield, Chicopee, West Hartford, and in and around Windsor, Suffield, Granby, Tolland, Chicopee, Springfield, Wilbraham, and Pittsfield.